So you want to know more about CMG’s new Discover Your Roads section? Of course you do, who doesn’t? You may remember the old format of DYRs put together by the magnificent Ed White and based on various CMG reader contributions. They came with the cutting edge of the day – PDF maps, but have long been due for a technological makeover. Well, that day has finally arrived and the new DYR section is fully technologized with ground breaking database technology and clicky bits. 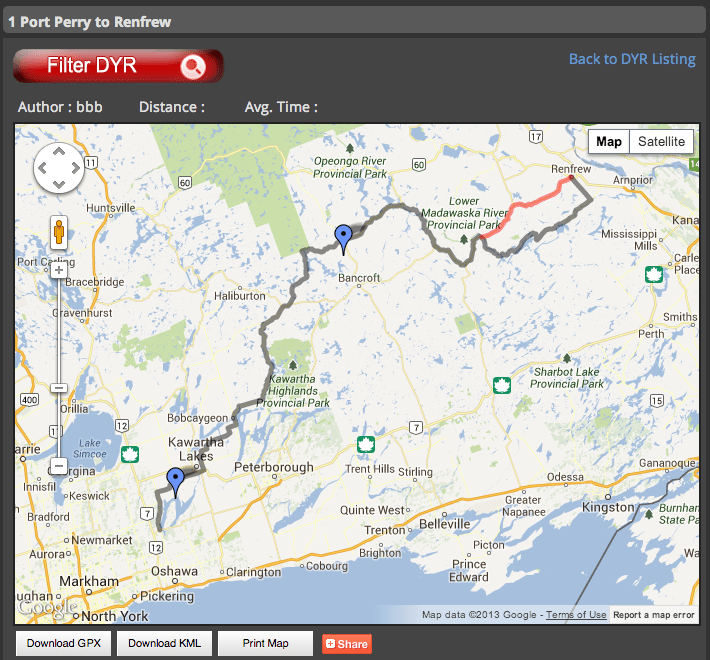 The new DYR homepage gives you a list of all the current trips we have on offer. Don’t panic, this is an initial listing of what we got and we will be adding to it as the months and years progress but as we are already well into the 2013 riding season, we thought we’d better pull our collective fingers out and get it launched. But I digress, you can either scroll down the list and pick a route to discover or click on the Filter DYR button at the top to narrow them down by Province/State, distance or type (A2B being a route between two locations and a Loop being a day’s ride to and from the same place). Of course, right now there aren’t a whole load of routes in there, so you can probably just scroll through them, but the more observant amoungst you may have noticed that they start at Port Perry, just east of the GTA, and meander their way eastwards through Quebec and into the Maritimes. That is not mere coincidence my fine feathered friend, no, that is the genius of CMG. Each of the current DYRs can be put together back to back to make one hell of a route from close to the GTA all the way to the magnificent island of Cape Breton. Brilliant! But before the applause dies down, don’t forget the Loops which to date is a mere one, starting and ending in Renfrew Ontario and taking you on a day’s ride around the magnificent Calabogie region of Eastern Ontario. What more do you want? What’s that? A scalable map with the route and attractions? Downloadable GPX and KML formats so that you can load the route on a GPS or into Google Maps to adapt to your specific needs? A printable map and and printable information on the route itself? You got it all. BTW, did I mention that the map shows the main route in dark grey, optional detours in red and access to points of interest in green? Done. Of course, hard as it is to admit, we’re not the be all and end all when it comes to recommended routes, so if you have anything that you’d like to add to an existing DYR or have a DYR of your own that you’d like to share, we have a contact us link at the bottom of each DYR page so you can let us know what you think! We’ll also get more DYRs we’re currently working on finished and posted as fast as is humanly possible, if not faster. So what are you waiting for? Get our there and ride! Okay, you know the drill – we tell you where you should go (no change there) and then cover our arses by saying that anything ‘orrible that happens has nothing to do with us. While we do everything within our abilities to ensure that the information presented by the Canada Moto Guide is correct to the very best of our ability, we cannot be sure that either something has changed or is just plain wrong. It’s the nature of beast – we do our best, what else can we say? For example a good road can turn bad, or a bad road can get repaved and do us all proud. Where there used to be a bridge, there may now be a giant chasm with spikes and unpleasant odours at the bottom. Basically use your noggin, know your own limitations and exercise great caution when riding on unfamiliar roads. We’ll do our best to point out any dangers, but we can’t be there to hold your hand – although we’d really like to, especially if they’re soft.